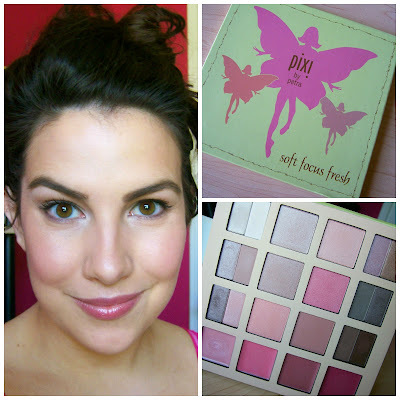 A couple days ago I was getting ready at my makeup desk (hence my hair thrown up in a clip and my pajamas still on in these pics), when I realized just how great this Pixi Soft Focus Fresh palette is! I felt compelled to take pictures right then and there so I could put together a blog post on it. I'll be honest... a lot of times I'll do a light & natural makeup look, and feel somewhat unfinished or incomplete. It's kind of hard to explain, but I love super glam makeup and the natural stuff doesn't always "satisfy" me. But after using this palette I was like, "wow! I love this look!" In fact I bounded into the living room asking Tyler "doesn't my face look so fresh?!" And he was like, "yeah it totally does!" (Thanks for humoring me, Tyler). But seriously, this is a great quality palette. It's $34 at Target, but I ended up getting this at a discount a few months ago when Pixi was on Hautelook. When I first got this palette, I was kind of surprised by the large size. It's about 3/4 of the size of my iPad. But once you open it, you can see that it's packed with lots of decent-sized eyeshadows, blushes, highlights, and lip colors AND a large mirror- justifying the size. FYI: the lighting on the pic above is making the shadows on the right side of the palette look slightly darker than they actually are. The shadows are a mix of shimmer, metallic, and a couple of matte shades. The six swatches on the left correspond with the shadows on the left side of the palette, and the six on the right are from the right side. Just as the name of the palette implies, you can get such a fresh look with these colors. I like that they're not ALL super light shades... there are some deeper greys, taupes, and browns that will allow you to create some contrast. I also love the interesting colors in here- like the coral and lilac. I'm super impressed with the texture of these shadows... not powdery and flakey- but actually really creamy and rich. Definitely comparable to high end shadows from brands like The Balm... one of my favorite lines for eyeshadow! This is a big deal, y'all! My ah-ha moment with this palette came after applying the blush and highlight. If you're going pretty natural with the eyes and lips... the cheeks totally make the look! These swatches correspond with the powders as they appear in the center of the palette. The top two shades are definitely highlights, and the second shade down on the left could be a nice highlight for deeper skintones. They are shimmery, but not sparkly or glittery. Of course any of these highlights/blushes could double as eyeshadows. The blushes are SO gorgeous. That pink in the center on the right is dynamite!! There's also a glowy peach and a deeper, satin/matte finish mauve-ish peach. The four glosses across the bottom of the palette are sheer, but honestly they show up prettier on the lips than they do on my hand. And you guys know, I don't have much patience for sheer lip colors! But when the natural pigment of your lips comes through, these glosses look really pretty. The first shade is just light and pearly, the second is a really light pink, the third is a dusty rose, and the last is a sheer berry. They're not sticky and actually feel kind of moisturizing, which was a nice surprise. For this look I'm wearing the pink blush (in the center on the right side), and the lightest highlight (on the top, left side). I highlighted down the nose on top of the cheeks/cheekbones, under the brows and in the tear duct area. On my lips, I'm wearing a mix of the pink and berry gloss colors. My eyes are obviously nothing intense, and certain shadows in this kit have the potential to go much deeper. I did a sheer wash of the grey shade (second down on the far right)-- I didn't really pack it on for intense color. I also smudged just a teeny bit of that shade on the outer part of the lower lashline. I'm wearing a little bit of black pencil liner very thin along the upper lashline, along with Neutrogena Healthy Lengths mascara. Just wanted to give you a little heads up on this palette! When you think about the 40 to 50 dollar price range of a lot of high end palettes at Sephora or Ulta, I'm really impressed that you can get this one for $35 (or if you wait for the deal on Hautelook like me... even less!) I think the shadow quality is phenomenal, and the blushes and highlights are exceptional as well. What a great kit for anyone seeking a soft and natural makeup look! Great gift idea too. I haven't tried many other things from the Pixi line, but one thing I DO love is the Brightening Peach Correction Concentrate which is think is AWESOME for undereye circles! Little miss Cupcake just crawled up on my lap. Trying to balance cat and laptop. New beauty video coming tomorrow... it's LONG & features those different Caboodles storage/travel ideas. I asked Tyler if we can name our next pet Caboodles. He's not a fan of that idea. Bushes in front of our house have the most beautiful pink blooms on them right now- need to get some pictures of that. Oooh wow, so pretty, Emily. That palette looks amazing- really loving those blushes. Your face really DOES look fresh hahaha! Too bad we don't get Pixi here in the UK or I'd be all over that! These shades look gorgeous - and so do you! This palette looks so fantastic. I like the Pixi line too, for their colors. Sometimes their eye-shadows do seem a bit chalky and don't go on that intense. :( I wish I had bought that set. I saw it on Hautelook and passed. Do the shadows have any fallout? I'm so excited! I got this kit on HL last week and it is taking forever to get here! Thank you for your review! Agh just came back from Target and couldn't make up my mind on anything from that brand so didnt end up getting anything. :( oh well next time. What foundation are you using? Your skin looks great!! You're so pretty Emily! This looks like a nice palette. You look much nicer when you wear soft shades makes you look younger. You do look fresh with this look, it looks awesome! Although I personally do not like combo palettes (lips, eyes, blush) I think this is a really nice palette! You look awesome! I love the fresh face look. I definitely need to buy this palette! AYYY! Now, I read this!! It was on HauteLook a few days ago! Now, I want it, Emily!! So pretty!! Love you!! Emily, I happened to check out Hautelook last week while at work and scored this palette for $10--with only a few hours to spare! I want to give it as a gift, so I am very happy to see your review! Your skin looks so glowy, this made me want to give my pixie palette another go. Those swatches look great! I love the look you created with it. Aww Em! You're so sweet and pretty. That palette looks lovely on you. Great review. I'm so excited for the next video. I bought this on Hautlook today for $9.00!!! So excited.